Our tax laws have gone through a historic change. GST or Goods and Services Tax has replaced existing taxes such as VAT, service tax, excise duty and several local state taxes and levies. GST is expected to have a far reaching impact. Whether you run a business or provide a service, however big or small, it is very likely GST will impact you. GST was rolled out on July 1, 2017. Businesses includes – trade, commerce, manufacture, profession, vocation or any other similar activity, irrespective of its volume or frequency. It also includes supply of goods/ services for starting or closure of a business. Services means anything other than goods. It is likely that services & goods carry a different GST rate. Persons includes – Individuals, HUF, Company, Firm, LLP, AOP, Co-operative society, Society, Trust etc. However, GST does not apply to Agriculturists. Having a PAN is mandatory to obtain GST registration. However, non-resident person can get GST registration on the of basis other documents, which the government may prescribe. One registration shall be required for each state. The taxpayer can choose to get separate registrations for its different business verticals in the State. You must collect and pay GST when your turnover in a financial year exceeds Rs. 20 lakhs. [Limit is Rs 10 lakhs for some special category states]. These limits apply for payment of GST. 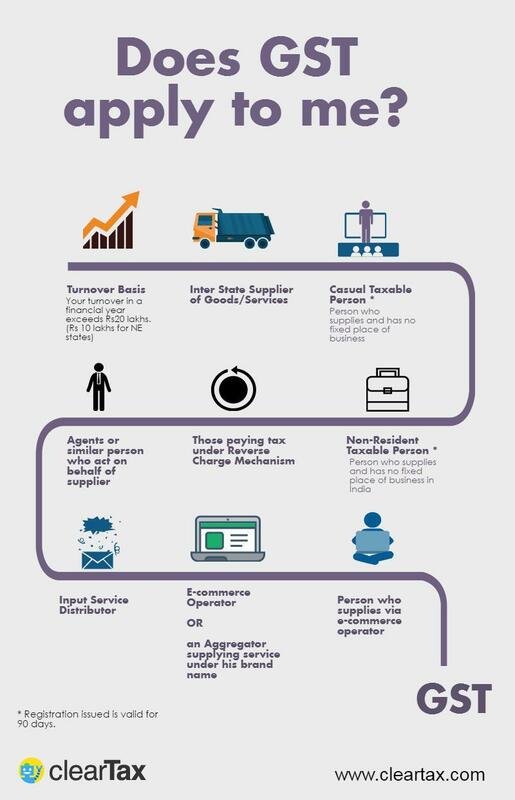 “Aggregate turnover” means the aggregate value of all taxable supplies, exempt supplies, exports of goods and/or services and inter-State supplies of a person having the same PAN, to be computed on all India basis and excludes taxes, if any, charged under the CGST Act, SGST Act and the IGST Act, as the case may be.